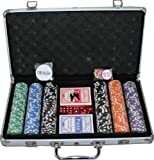 Poker Chip Sets | Buy Poker Chips Sets at the best prices! 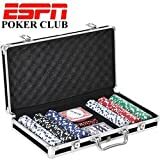 Sharpen your skills and beat your friends with this ESPN Poker Club Set! This set has everything necessary for casual games in the basement and tournament games under the lights! 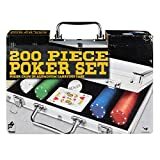 There are 300 poker chips in this set in 5 colors (green, white, red, black, and blue). Each chip is casino grade, weighing in at 11.5g and ideal for tossing casually as intimidation. Also included in this set are two decks of playing cards, a dealer button, and 5 red dice for a classic game of Poker Dice. Everything is housed inside a sturdy deluxe aluminum storage case. This case….